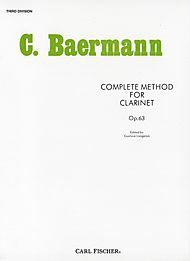 The Baermann clarinet scales, better known as the Carl Baermann, Complete Method for Clarinet, Third Division, Op. 63. This scale method book is very commonly used with advanced high school students and in many conservatories and schools of music. It is an advanced book. 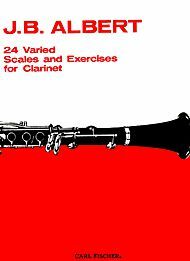 If you are just familiar with the major scales (or do not know them all), you should consider working out of the Albert clarinet scales book first. The most commonly used Langenus version. This Snavely version keeps all different scale types organized by key signature. This Dowani version has a CD example with it. No. 1 – All twelve major scales with relative melodic minor scales going the range of the clarinet. Each scale completes with its arpeggio ascending to the top scale, tonic note. 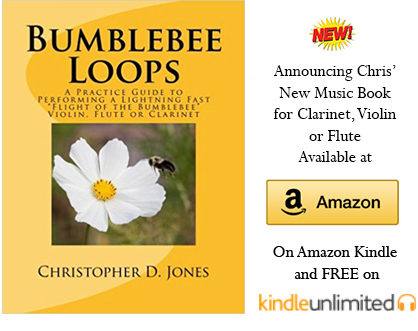 This book does a good job of covering the enharmonic F# major/Gb major and relative melodic minor scales of d# minor/eb minor scales. On page five, after the major and minor scales, you’ll find the chromatic scale from low e to super high c (above the treble staff five ledger lines and a space). No. 4 – All major and minor interrupted scales – I usually call these “fours” as you ascend four notes at a time c d e f and then descend to the next scale tone d e f g, then e f g a, etc… These patterns are very helpful in learning your scales. Above, you see the commonly used Langenus version where many of us poor saps had to turn pages to work on all of the scale variations. The CD accompanying this Baermann method gives you three tempi, slow, medium and fast to practice. Having the example of a professional clarinetist work through these scales for you to listen to and practice with is worth its weight in gold. MOST IMPORTANT – WORK ON YOUR BAERMANN CLARINET SCALES !!! 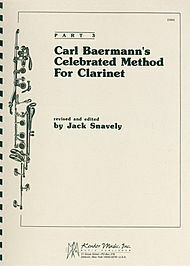 Why do you practice the Baermann clarinet scales? Learn more about practicing scales here. The Baermann scale book is pretty heavy. If you do not think you are ready for it, read about the Albert scale book here.